Nathania represented the region in the finals of the National ‘Poetry by Heart’ competition in London. Nathania made it to the finals after winning the regional competition, held in Middlesbrough Central Library. She did exceptionally well in the regional competition. Nathania, who is only 15 years old, was the youngest pupil to compete against sixth form pupils from local schools. She recited two beautiful poems ‘Originally’ by Carol Ann Duffy and ‘Envy’ by Adelaide Anne Proctor. It was a fantastic achievement for her to be crowned the winner of the regional heats and progress to the finals. 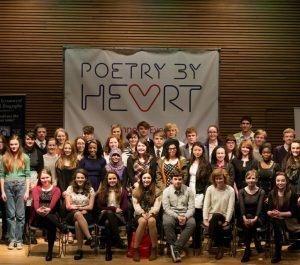 Nathania was invited to an exciting, all expenses paid weekend of poetry and competition at the National Portrait Gallery in London, where she had to compete against 40 pupils from across the UK. At the finals Nathania chose to recite ‘The Destruction of Sennacherib’ by Lord George Gordon Byron, and ‘Originally’ by Carol Ann Duffy, which she performed beautifully in front of a panel of guest judges from the world of poetry, acting and English teaching. Although she just missed out on the main prize she was highly praised by Sir Andrew Motion and even brought one of the judges to tears for her heart warming performance. “We are extremely proud of Nathania in reaching the finals and she received excellent feedback from the judges. At Red House we encourage pupils to not only achieve their full potential academically but to excel in all aspects of school life. It is through developing their individual gifts, talents, skills and knowledge that they will become confident individuals. We consistently perform very well in public speaking and we recently won the regional English Speaking Union (ESU) public speaking competition, which Nathania now hopes to enter next year”.